September 18, 2017, from 5 pm - 9 pm the Idaho Coalition and All Under One Roof LGBT Advocates will have a booth in the Kind Community Kickoff Event in Historic Old Town Pocatello. We will be providing free rapid HIV testing from 5 pm - 7 pm. 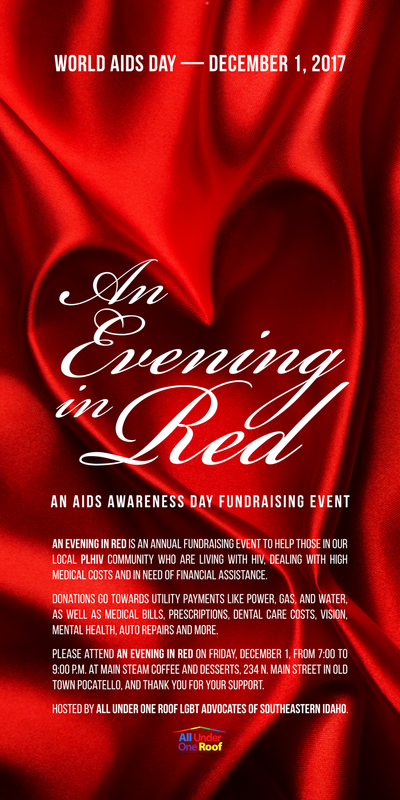 This event will lead into All Under One Roof's "An Evening In Red" World AIDS Day Fundraiser for the ISU HIV Clinic. This is also an Art Walk in Old Town Pocatello and Old Town has themed their Art Walk as an "Evening in Red". Pocatello Mayor Brian Blad will speak and the Fundraiser usually earns $15,000.00 - $20,000.00 for PLHIV which is distributed by our fantastic case managers Emily Calhoun, Russ Fagnant, and Jenn Walton.